A postcrosser who received one of my postcards asked me if I did any mail art. It occurred to me that I haven't posted about anything I've sent in absolute ages. It's long overdue! I had a tough fall for letter-writing, and my sent stats have been fairly paltry until December, when I really tried to plunge in again as best I could. I wrote and decorated this letter on December 31, 2012. I had so much fun breaking out my washi tape, stickers, rubber stamps, postage stamps, and all the fixings... they had sat gathering dust for quite a while. My cats Soda and Memo (of blessed memory) adorn the photo stamps, and in fact that stamp of Memo with the fur wig is the last one I had. 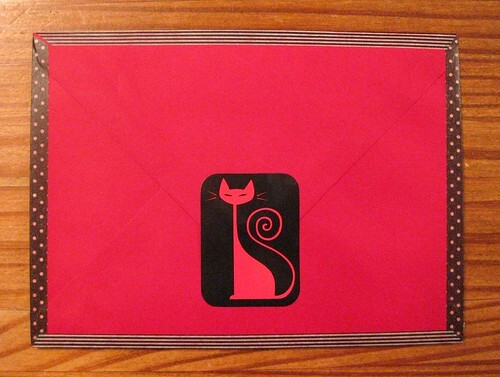 The back of the envelope isn't quite so busy, just some red and black and of course a fine Red Tango cat sticker. Happy New Year! My best wishes to all blog readers and postal enthusiasts for a fantastic mail year in 2013. I love this! It's really creative and smart looking. I've made postcards with a few pictures of Sammy, my current beloved rescue, and have thought about working his lovely phizzog into mail art but haven't done it yet. Thank you for the inspiration! Thanks - glad to help inspire! I don't know what a phizzog is, but I bet it would make a great addition to mail art. Nice to see you creating mailart again. Warm wishes to you! I just ordered the book Good Mail Day and am trying my hand at envelope folding. 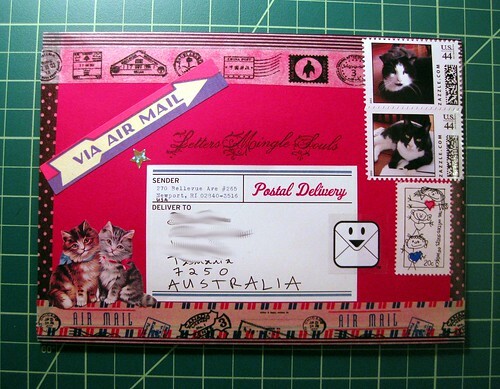 Here's to more mail art in 2013! Happy mailing, MM! Ooh, Good Mail Day is fabulous - have fun! 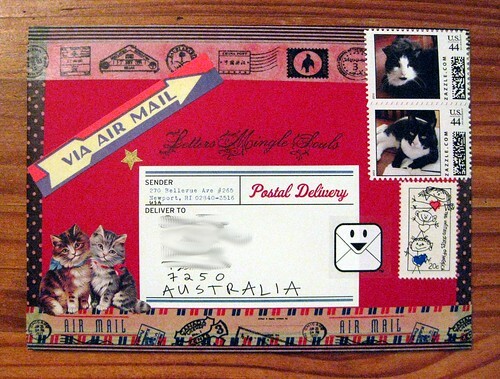 I found some vintage postage and magazines that I can make envelopes out of.. I can't wait to get started. PostMuse is featured on Postcrossing!